Got to love these treasures: Valued for their beautiful ferny foliage and brilliant autumn colour. They do better in a sheltered place. Good selection to choose from, including patio, weeping and standard trees. 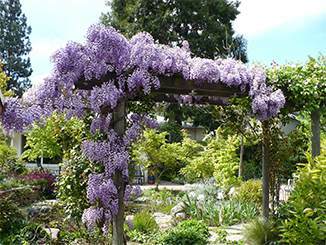 The epitome of the veranda planting with its racemes of purple flowers dripping from the roof line. Give it room, prune it severely once full grown for it will reward you. Purple and white varieties available.